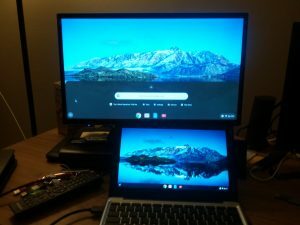 This past weekend, I finally decided to spring for a Chromebook. I’ve been thinking more and more about a Windows replacement machine, at least for basic tasks. I also wanted an inexpensive solution that would extend the life of my current laptop. I often don’t need the full machine out on the road and the smaller profile of the Chromebook makes an attractive alternative. The ASUS C202SA-YS02 is a ruggedized, water-resistant Chromebook with a rubber bumper surrounding the unit and advertises the ability to withstand a drop from 4 feet and spills to the keyboard. I’ve elected not to test those limits but it’s nice to know in case accidents happen. On the tech side, this model features 4GB of DDR3L RAM and a 16 GB SSD for local storage of documents. It also sports 2 USB 3.0 ports and an SD card reader on the side that allow for the addition of storage as needed. The processor is an Intel Celeron N3060 with a speed of 1.6 Ghz. While these specs might not seem like much to a Windows user, they run the Chrome OS pretty well, especially with a solid state drive. The Chromebook connected by HDMI to one of my 24″ monitors. The resolution can be adjusted upward to suit. At 11.6 inches, the anti-glare display is a bit smaller than the average laptop user will be accustomed to but the resolution is 1366 x 768 and this model features an HDMI port which will output the display to an external monitor. The C202SA has an Intel HD Graphics co-processor and handles streaming media very well. 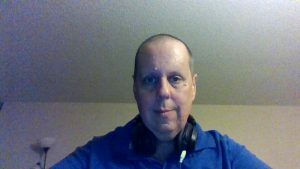 I tested it with Hulu and YouTube over the weekend was very pleased with both the picture and the sound. The sound is especially impressive given the low profile of the small speakers on either side of the unit. The 802.11a/b/g/n wifi is very capable and detects both 2.4 and 5 Ghz networks. I’ve used it on my home network and my phone’s hotspot and found it to be very reliable. It also has Bluetooth. What I really like about the Chromebook is the long battery life. It’s estimated at around 10 hours based on use. I haven’t timed it yet but I do notice that it retains the charge pretty well and has a fast recharge time. Turning down the screen brightness significantly extends the battery monitor’s estimate of remaining time which makes sense. The wifi and Bluetooth radios can also be deactivated when not needed which would probably do something to extend the life. Still, given that I’m doing well to get close to 3 hours from my main laptop, I don’t see myself worrying too much about running out of time with the Chromebook. You can see my actual unboxing of the C202SA on YouTube. The setup is pretty straightforward – take it out of the box, plug it in and it starts as soon as you open the lid. The Chromebook guided me through the setup from there. It asked me to sign in with my Google account and then downloaded several updates to the Chrome OS. These updates change the look and feel a little but it’s nothing too drastic. In my opinion, the updates actually improved the interface a little and added a convenient control or two. After the setup, I was free to wander about the system which is pretty intuitive for anyone who is familiar with an Android system or has spent any time with Google applications. The system menu is also reminiscent of Windows with a Launcher (*cough* Start) button and its Search bar. The Desktop area can be customized with a preferred image but does not hold any files. This might actually be a good thing for those of us who like to store everything there until it becomes so cluttered that it takes an hour to clean off. The system menu is available by clicking the clock just as in Windows. It provides quick access to many of the settings. As I mentioned, one of my first tasks was to test out the sound and video which you can see in the video above. I would have no problem using this as a portable streaming viewer, especially with the long battery life and it’s extra portability. Whether on its own or with a good set of headphones or earbuds, it’s great for enjoying multimedia. The next thing I thought of was expanding the choice of apps. The Chromebook comes with a decent selection of Google apps including basic office apps for creating word processing, spreadsheet and presentation documents. There’s also the Google Play store which supplies additional programs as needed. I was able to install the Kindle Cloud Reader to access my Amazon library. With 16 GB of storage, you might have to pick and choose what to add but there’s already enough that comes with the Chromebook and apps that can be run online that it shouldn’t be a big problem. The Chromebook keyboard is a bit different from what you might be used to. There’s no Start button, no Shift Lock and no function keys. There are a number of shortcut keys and combinations that will do what you need so it might take some time to learn those but it won’t stop you from being immediately productive through the menus. The keyboard also has a nice feel to it and is of the right size for my hands. The files explorer offers a similar view of items on local storage, removable media and the user’s Google Drive. The mousepad might take some getting used to and there is no right-click button. To simulate a right click, you tap the pad with two fingers at once and it will pop up whatever context menu is available. Another solution is to simply plug a mouse into one of the USB ports and provide an actual right mouse button. The Chromebook recognized my Logitech wireless mouse with no fuss whatsoever and it worked great. 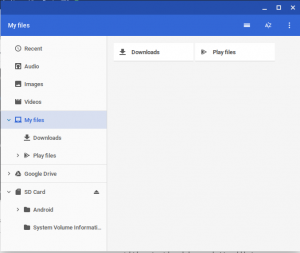 The file system viewer in Chrome OS is enough like Windows that it should be easy enough for most users. Files can be moved around, copied and deleted using the same techniques that you’re probably used to. 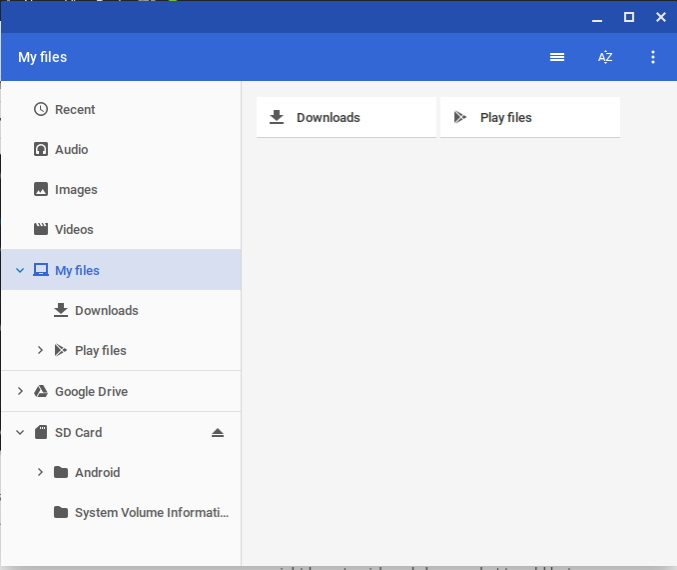 The contents of the Google Drive are right there along with all the other media and you can copy or move files between it and the other directories or within applications. As you can tell by now, I’m really impressed with the Chromebook at this point. I’ve used it to write this entire article in WordPress via the Chrome browser and, although the smaller screen is a little bit limiting, I can see myself using it regularly. I have seen a couple of drawbacks and one is the quality of the onboard web cam. It takes JPG stills at 1280 x 720 but the quality is not great as you can see by the sample here. The video is at the same resolution and quality and is written in MKV format rather than MP4. The sound is okay but not spectacular. You can install Skype from the Play store if you want to use the Chromebook to communicate but you might not want to rely on the Chromebook for Skype calls where appearance is important such as interviews or other professional meetings. 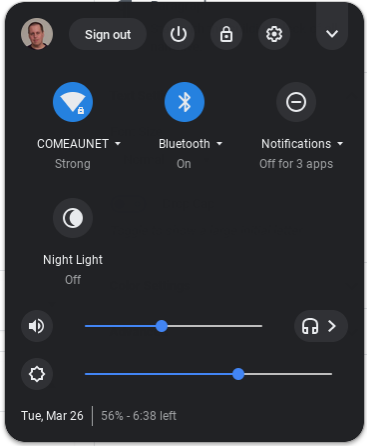 The only other problem I’ve had so far was, oddly, connecting my Android phone to the Chromebook by either Bluetooth or USB. The ASUS Chromebook features a Smartlock feature which allows for the notebook to be unlocked with an Android smartphone. I wasn’t able to get the two devices to maintain a Bluetooth connection for more than a second and I eventually removed the connection to the phone in the settings. 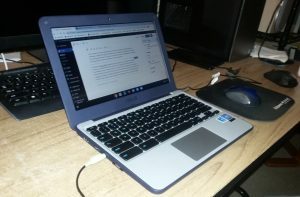 When I tried connecting via USB, the Chromebook was often unable to scan the files on the phone and even hid my local files on the notebook until I locked and then unlocked the notebook. I finally settled for transferring photos from the phone via my Google Drive where I could import them directly into WordPress. 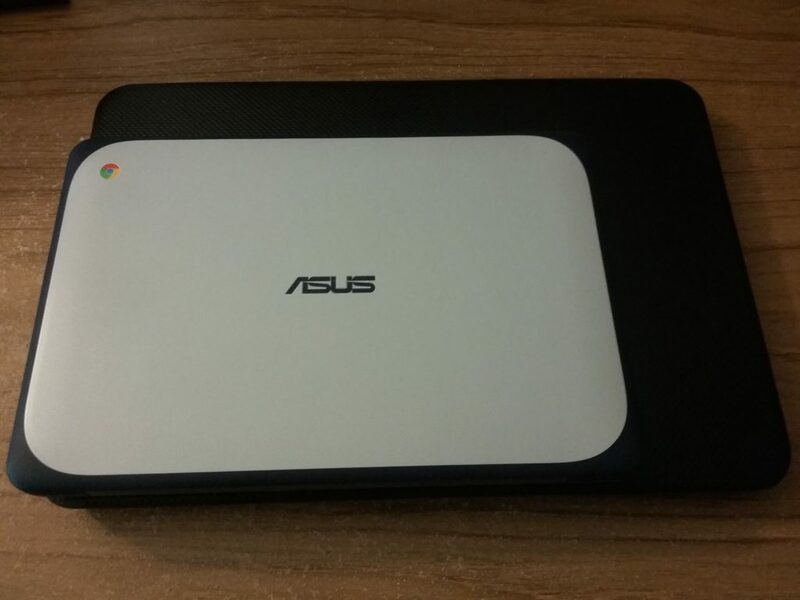 The small screen and size might be a turnoff for some but its portability and full set of features make the ASUS Chromebook a great alternative to a Windows laptop. Overall, despite the camera quality and file connection issues (which I might get worked out eventually), I really like the ASUS Chromebook and can see myself using it whenever possible. If you are especially sensitive to neck strain, the smaller size and screen might give you a problem for long sessions but that’s not a reflection on the actual product. For someone who needs an ultra-portable and sturdy solution on the road or to save space in a small college dorm room, The C202SA is a great option. Currently, the ASUS C202SA is selling for $199 on Amazon.com. If you don’t mind taking a chance on a refurbished model, you can get one from ASUS through Amazon’s site and save just over $25. The refurbished unit carries a 90-day warranty. I thought about it but opted for the new model. I also understand that a number of these machines are available second-hand through sites like LetGo.com, probably from college students who are done with them and looking to get some cash back. Again, that’s an option if you don’t mind taking a risk on a second hand computer. The ASUS Chromebook sitting on top of my Dell Inspiron laptop. Note the difference in size. This will be welcome portability for some and a difficulty for others. 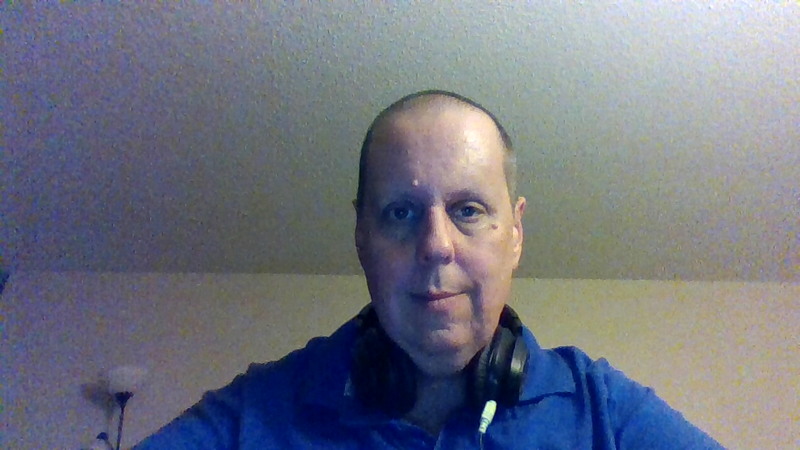 This entry was posted in Hardware, Personal Tech, Reviews and tagged featured on March 27, 2019 by Andrew Comeau.